Thumb sucking – the effects may be long term! 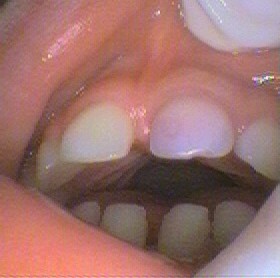 This then causes the upper teeth to be pushed apart to form spaces and to tip forward. The lower teeth are push in the opposite direction and lean in towards the tongue. The shape of the face can be changed and the growth pattern of the jaws altered. In severe cases lips may not come together when swallowing. A seal is not able to be formed and swallowing may become compromised. A lisp may occur as the tongue can’t sit behind the top front teeth properly. Localised crowding may occur and the alignment of the jaws may be altered. 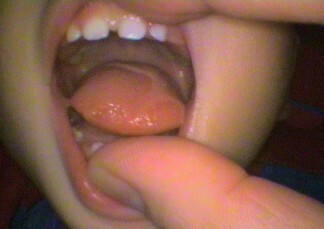 The front teeth do not meet anymore, causing unusual chewing patterns. Orthodontic treatment may need to done. The habit may cause a new habit of mouth breathing instead of breathing through the nose. Mouth breathing dries out saliva. Saliva protects teeth and aids in swallowing. Nail paint – This has an unpleasant taste and is available from the chemist. Wear a glove – to discourage the habit. Place elastoplast – which is an adhesive band-aid cut from a roll, and place over the thumb. Encourage bonding with a special toy. Offer rewards for stopping the habit – not sweets! Provide distractions by encouraging playing with toys or cuddling them till they fall asleep. Use a dummy – A dummy also can cause similar problems to thumb sucking but a dummy can be thrown away, a thumb is for life! It’s important to seek advice early rather than later! Next week: The Dummy – and how to get rid of it!